Item # 309811 Stash Points: 995 (?) This is the number of points you get in The Zumiez Stash for purchasing this item. Stash points are redeemable for exclusive rewards only available to Zumiez Stash members. To redeem your points check out the rewards catalog on thestash.zumiez.com. Embellish any soft material from a jacket to a backpack with the Mushroom Cloud enamel pin from Obey. 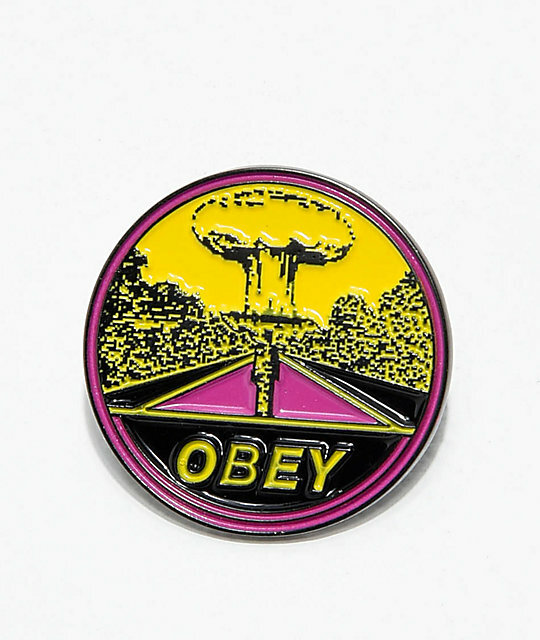 This round, 1" in diameter, pin features a purple road leading to a yellow mushroom cloud with "OBEY" at the bottom. Mushroom Cloud Enamel Pin from Obey. Yellow and purple mushroom cloud graphic.